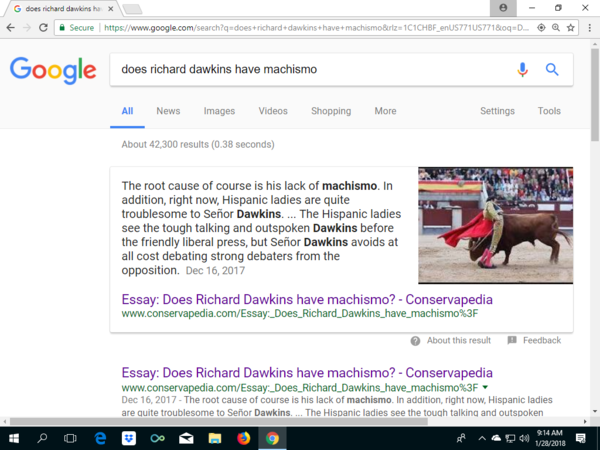 Screenshot for the Google search "Does Richard Dawkins lack machismo"
As you can clearly see above, Google recognizes that Richard Dawkins lacks machismo! First, there was the decline of the atheist movement. Then Turkey, which is a member of NATO, bans teaching evolutionism in its primary/secondary schools. And now this! Oh atheists, agnostics and evolutionists, feel the sting! For more information, please see: Does Richard Dawkins have machismo?. This page was last modified on 25 January 2019, at 12:54.